Ohioans overwhelmingly rejected the healthcare mandate provisions of Obamacare. No federal, state, or local law or rule shall compel, directly or indirectly, any person, employer, or health care provider to participate in a health care system. My own state’s senator, Claire McCaskill, championed Obamacare while Missourians overwhelmingly (by over 70%, 3-1 in every county) passed the Healthcare Freedom Act which excluded Missourians from the penalties of Obamacare, including jail time and fines. I wondered how Brown was going to reconcile this troubling disparity in his state. Unfortunately, while the Senator stood and asked questions from a number of progressive attendees, when I finally had an opening to ask my question, he refused. “Not for you,” he remarked, pointing at me, before rushing off with his assistant. He later deleted it, but not before I and others screencapped it. Twitchy called Brown’s behavior “rude and dismissive.” Mediaite attempted to pass it off as a “botched interview attempt” which would only make sense if I had “botched” politely asking Brown for a moment of his time. 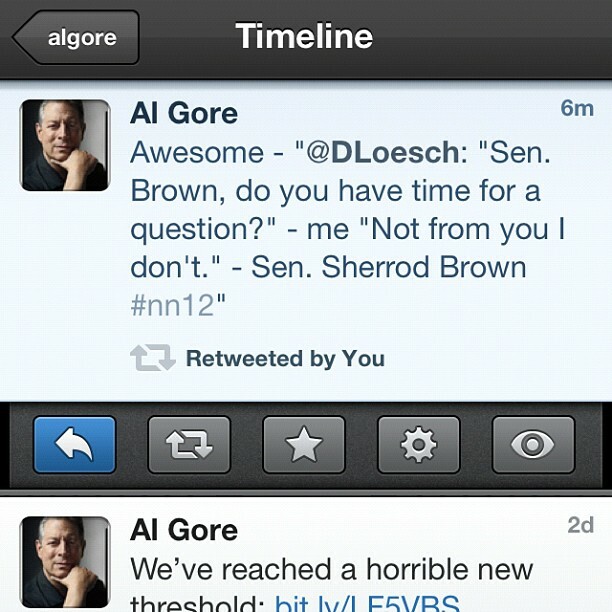 Brown can’t rely on Gore to bail him out of his situation and he would do well to not run from honest, politely asked questions from those who simply want answers. *MORE: Shark Tank gets a few minutes with Brown (who thought he was speaking with a friendly).